Philadelphia drivers were greeted to a profane sign about former Mayor Frank Rizzo Sunday night. Twitter user @thecohshow27 first posted a blurred-out picture of the sign. According to NBC10, the banner, hung above the 10th Street overpass on I-676, featured an expletive, a photo of a pig and Rizzo's name. The city is currently grappling with what to do with a statue of Rizzo near City Hall as calls for its removal have intensified. Protesters held several demonstrations at the statue in August, and gained the support of Councilwoman-at-large Helen Gym in demanding it be taken down. Those in favor of toppling the statue of Rizzo say it symbolizes his targeting of the black and LGBTQ communities during his tenure as police commissioner and mayor. The statue in front of the Municipal Services Building, as well as a mural of Rizzo on East Passyunk Avenue, have been vandalized several times in the past month. 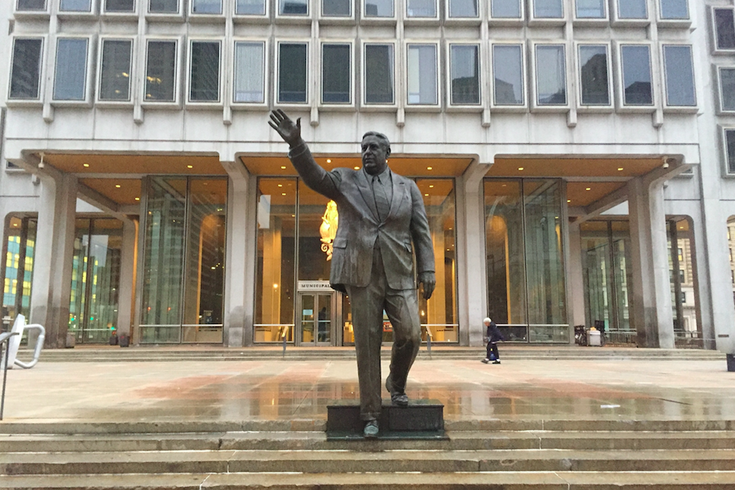 Mayor Jim Kenney has said the decision on what to do with the statue rests with the city's Art Commission. However, his office has tried soliciting feedback on what to do with the monument. "The purpose of this process is not to take an opinion poll on the statue’s current location, but to look for the best ideas from the public for the statute’s future," Kenney's office said. Those interested in submitting ideas can do so here before 5 p.m. on Sept. 15.